Polish company Aqua Life, which was set up only a few years ago, has succeeded in exporting its desalination blocks to the UAE and is expanding its marketing capabilities to sell more of the product to the region and internationally. “Our units have been sold to Abu Dhabi and now we’re preparing for deliveries to Oman,” said Dorota Chudzik, owner of ADL Water Desalination, the partner of Aqua Life for Gulf countries. “We have installed demo units in our showroom in the Jebel Ali Free Zone. We presented our equipment at a Dubai exhibition in April and the unit from the show was sold and is operating in the UAE. While Aqua Life has its head office and production facilities in Poland, the knowhow comes from Russia where also the products’ designers are based. Aqua Life markets its desalination blocks as “the world’s first compact plant developed by Russian engineers for desalination of saltwater.” The apparatus has independent modules that operate under the reverse osmosis principle. The modules are installed on supporting distribution units and the arrangement incorporates an automatic power system management and control as well as a high-pressure pump that combines with system recovery. An important feature is that a desalination plant of any capacity is obtained merely by adding the required number of modules. Chudzik said some Aqua Life units are operating in Russia and other East European countries but that 95 per cent of the production heads for the Far East, the Middle East and Southern Europe. “Our oldest customers are from Yemen, where four blocks are producing drinking water for over two years. One installation is successfully working in Nagasaki, Japan, and there are demo installations in various countries including the UAE, Egypt, Nigeria, Spain, Indonesia and the Philippines. 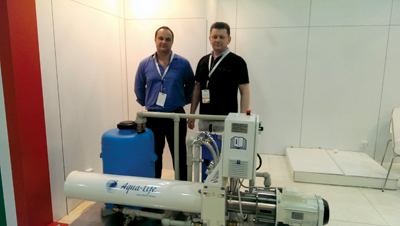 Aqua Life was an exhibitor at the Water and Electricity exhibition in Wetex in Dubai last April. “We faced our competitors but at the same time we discovered many opportunities with companies operating in the water-treatment business and were looking for partners. We received many inquiries for big projects, but as it is a long process we are still in the development and bidding stage,” commented Chudzik.